Dogs are like kids. Most of them don’t like to take baths. But even shorthaired, wash-and-wear dogs need proper grooming and an occasional bath. Bathing too often, however, can remove the natural oils that keep a dog’s skin and coat healthy. How much washing is too much depends on the humidity and the shampoo used. In general, a good brushing is all that a dog needs to get freshened up. In addition to removing dirt, a regular brushing will clean out loose hair and make your dog more comfortable. 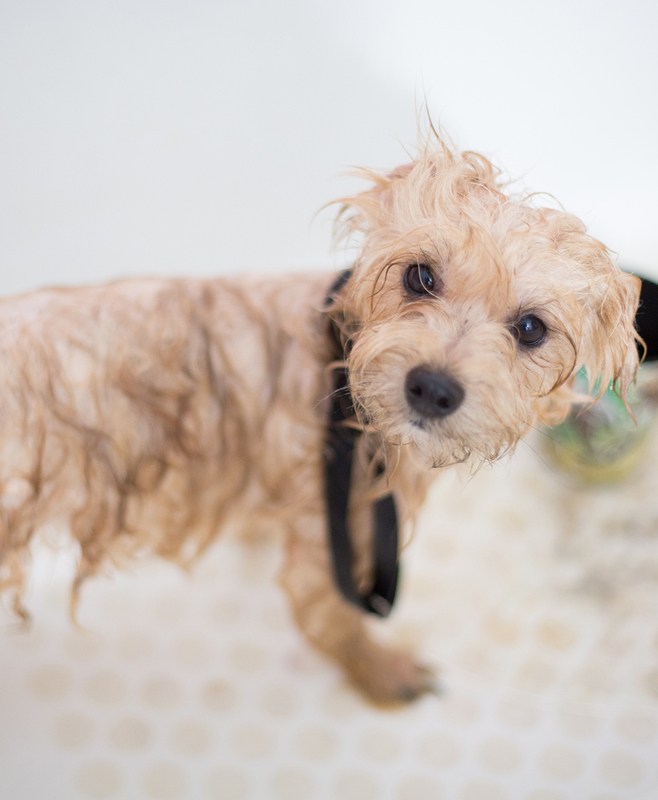 But bathing is appropriate when a dog has significant body odor – for example, when Fido has rolled in something he shouldn’t have. So remember – a dirty dog needs a brush and a smelly dog needs a bath. As a general rule, you should clean your dog’s ears about once a month or when bathing. If your dog swims or gets his ears wet regularly, you’ll want to do it more often. Ear cleaning starts with good general grooming. First, remove excess, dirty, or matted hair from around the ear canal and the ear flap. In some cases, excess hair may need to be gently removed from inside. A technician or pet groomer can remove the hair if needed. Next, choose a mild ear cleaner formulated especially for pets. Avoid using vinegar, alcohol, or hydrogen peroxide. There are several types of cleaners to choose from. Some cleaners break up wax, while others dry the ear canal. There are combination products as well. Now, it’s time to actually clean out the ear canals. Always be gentle! The ear canals and flaps are sensitive. Overly aggressive cleaning can actually cause damage to the delicate ear structures. Pick up an ear flap and dribble a small amount (a few drops) of the appropriate ear cleaning solution into the ear. The solution should flow down deep into the canal. Massage gently at the ear base for 10-20 seconds — you will probably hear the solution squish around as you massage. This should not be painful for your dog. If it is, have him examined by our vet. Repeat the cleaning procedure with the other ear canal. After massaging, stand back and let your dog shake his head to bring softened wax up out of the ear canals. Use clean cotton balls to gently wipe out and up the canal, removing any wax, debris, or cleaning solution you see. For small dogs, you may need to use cotton balls or baby wipes that have been pulled in half. Avoid using cotton swabs — a cotton swab placed too deeply or forcefully into the ear can cause ear drum damage, pain, and hearing loss. You may be eyeing your dog’s eyes, and realizing they need a good cleaning – especially if you have a pup with long fur. First, make sure that there is only dirt around the eyes – if you notice redness, pus, or swelling, call our veterinarian. If all you see is a little bit of grime, carefully trim the hair around your dog’s eyes, cutting parallel to the eyelid. This will keep hair from scratching your pet’s eyes. Then use a soft, wet washcloth or special eyewipes to gently clean the eye area. If the fur around your dog’s eyes is stained, don’t worry – this is a natural phenomenon. But if you’re bothered by the sight of it, you can look for commercial cleaners that are designed to remove tear stains. – Of course, we are always here to help clean your pet’s eyes. To be safe, bring your pet by for us to check out the eyes to make sure nothing is medically wrong.